In this server all action takes a place in Elven Village territory, so you will not get borred. There are custom farming zones with custom drops. 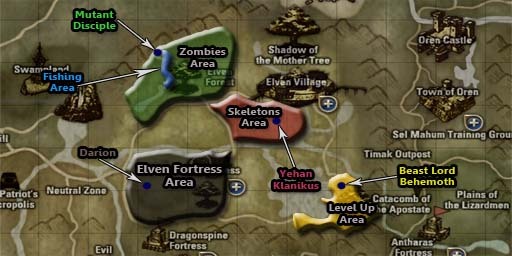 Each area has its own Raid Boss and Grand Monster. Server start date: April 12th, 2014. Raid Boss respawn time: 4-7 hours. Grand Monster respawn time: ~1 hour. Olympiad Battles time - from 18:00 to 00:00(GMT+3). New heroes appears on every Sunday 12:00(GMT+3). There are working Gludio Castle and Dragonspine Fortress Sieges. Gludio Castle siege starts every Sunday 20:00(GMT+3). There are 6 categories of achievements and 20+ achievements in total. Also you will be notified how many monsters you killed & how many are left to kill until you reach next level. For every completed achievement level you will be rewarded with various items and passive skills. If you like nonstop pvp battles this i a right place for you. There are a lot of different maps with different modes: "Teams Based" or "Free for All". For each killed player you'll be rewarded with "Arena Coin" which can be used in Arena Shop. Additionally you'll get Adena and other various items. When a map ends, a player killed most enemies will be rewarded with a special prize. This feature allows you to change the way your armors and weapons looks. For more info use a voiced command - .dressme. This is a custom instance where you can fight against Heroic Monster. There are 3 instance types: Easy, Merciless and Bloody. A special NPC that spawns once per day. Here you can buy a Masterwork weapons, change the type of armor and buy other useful items. This is a global event where each player receives a permanent PVP flag. There are a special raid bosses tower, where defeated 4 bosses will take you to the main server boss - Baium . More information about it can be found in the game. Working Freya Armors, Wepons, Jewels. GM Shop Tax - A Clan which owns a Gludio Castle can setup a tax up to 5% depending by clan level. Current tax info and castle treasury you can see in GM Shop by clicking button - "Tax Info".